GOOD worlds that incorporate ALL EPs. Re: GOOD worlds that incorporate ALL EPs. I really like Sunset City by Dudsnz, it has been updated to be a combination of Bridgeport and Sunset Valley. 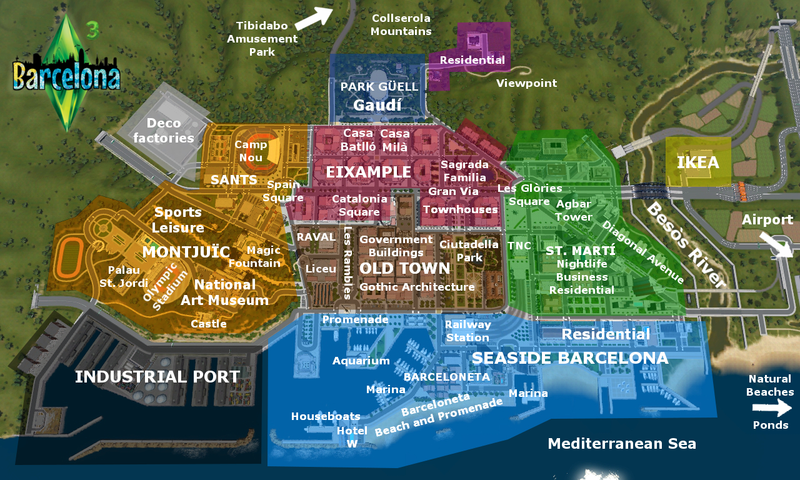 It's all updated for Supernatural and has Beaches and such for Seasons. It's still in Beta but I've been playing it extensively with Seasons installed and I'm really enjoying it, also due to the large space you can place plenty of your own Lot's. Anyway you can check it out here http://forum.thesims3.com/jforum/posts/list/582680.page I think it's perfect for all EP's. Ann Arbor from My Sim Reality has been updated a bit for Seasons. It's a large world, with lots of variety. Sunset Valley 6.0 (Ambitions, Late Night, Generations, Pets, Showtime and Supernatural)! Buy elixirs and magic stuff, join gardening competitions and get your Sims' fortunes told. Do the words 'ALL EPs' mean nothing to you? Why are you posting this here? Then why u asking that question to me? Do you think Sunset Valley 6.0 didn't incorporate ALL EPs? Reading comprehension just isn't your thing, is it? It lacks Seasons content. The description, pictures, and links are all pretty clear about that. I suspect an update will be forthcoming, or that the creator assumes most downloaders can swap the central park lot for the festival grounds pretty easily on their own, but it's not an all-EP world as-is. I think it's still useful to link to, though. It's not as if adding the festival lot is particularly taxing, there's already one that's been designed for Sunset Valley, after all. There is a small problem with just replacing the big park in this save with the pre-made EA gave us. In this save, that park is used as a showtime venue, and the festival lot is not, so replacing it you'd lose that venue. You could find a new spot for a smaller venue I supposed, I haven't investigated how easy that would be though. Has anyone tried Legacy Island? I don't have an exchange account so I can't download it, but it claims to have areas incorporating all EPs, as well as all spawners, a tomb, and multiple legacy-sized lots. It doesn't mention being updated for Seasons, except the edition of swimmable beaches, so I guess you'd have to add a festival lot yourself. I'll give it a try and report back. FYI, Morikopo Island/Resort has been updated for Seasons. I haven't tried the Seasons version yet, but the Supernatural version is fantastic and I doubt it's much different. The same creator also made Howell Island, which is also for Seasons but with a spooky/supernatural theme. I'm not clear on the difference between Morikopo Island and Morikopo Resort, other than the resort requiring Sunlit Tides and the Lucky Simoleon Casino. -Enjoy the most you can out of each season with a festival lot. You're not clear on the difference, yet go on to explain the difference in the same sentence? I think it might be more than just using some extra content around town. Maybe some extra lots, or a different feel to the neighborhood? It doesn't say. Didn't try it yet so I have no further opinion about it but it's also supposed to have been cleaned of bugs and populated more. Page created in 5.215 seconds with 20 queries.